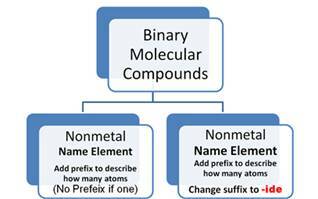 Binary Molecular compounds are explained in Chapter 3 Section 3.5 Guideline #2. 2. Due to the covalent bonding there are many ratios of the same two elements making many different compounds. For this reason, the chemist states how many atoms of each element are present in the chemical formula in the formal name of the compound. 4. The element’s name that is shown first in the chemical formula is written first using the proper prefix to indicate how many atoms of that element are contained in one molecule of the compound. If there is only one atom of that element it is often found without the prefix mono. If you leave the prefix off then it is understood that you mean mono. 5. The element’s name which is written second in the chemical formula is written second in the chemical name, but in addition to the prefix indicating how many, the suffix of the element’s name is changed to -ide. We use common names for NH3, and H2O, as shown Guideline #4. What would be their correct binary molecular names? As a spoof, the chemist at Dupont on the Delaware River created web site alerting you to the toxicity of a compound DHMO http://www.dhmo.org Visit this site!